Having less-than-perfect credit can easily lead to additional hardships. Not only does a poor credit score make buying big-purchase items like a home more difficult, in many cases, it causes you to be charged more for the same products and services (like auto insurance). In addition to helping you get in a great vehicle regardless of your credit, Integrity Auto Finance helps you improve your credit along the way! 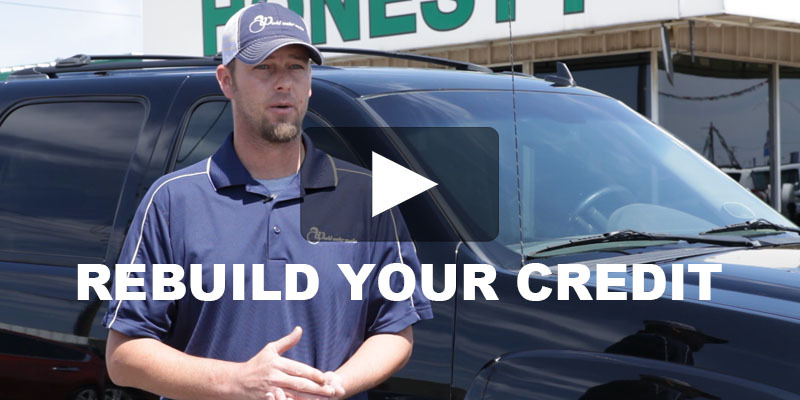 Check out the video below for more information, as well as a customer testimonial describing how buying a truck from Integrity helped him effectively rebuild his credit, allowing him to buy his home. Narrator: At Integrity, we do everything we can to help you rebuild your credit. We start by structuring deals with affordable payments. We set you up for success! Making timely payments on your vehicle will help improve your credit. Where most Buy Here Pay Here dealers don’t go through the trouble of reporting your payments, Integrity reports to all three major credit bureaus. This ensures that your on-time payments help raise your credit score. Latoya: They actually worked with me, as far as making my car payments to where I’m able to afford them. Jeremy: I went in, I was looking to purchase a home. I went in and talked to a banker, and that guy, he looked me straight in the eye, and he said “Sir, you don’t even qualify to talk to me.” I said, you know, it’s time to get us on the right track. We got to start doing something. We can’t be paying $1,100 a month for rent for the rest of our lives. I saw this Avalanche up on the rack, and I said that’s what I want. So far it’s worked out perfect. Within six months, I’ve gained 140 points on my credit score. And now I have my eyes out shopping for our home to raise our family and grow old in. Ready to fill out an application? Our online finance app is fast, easy, and secure. Fill out the information, and one of our sales associates will get back to you shortly!